Please refer to our stock # MOR6905 when inquiring. 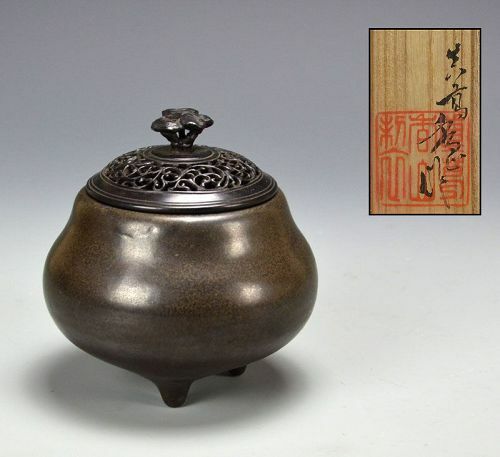 A lovely bun-shaped soba-green koro with carved wooden lid by Miyagawa (Makuzu) Kozan enclosed in the original signed wooden box. It is 12 cm (5 inches) diameter, the same height. The combination of rosewood lid and green body is strongly influenced by Chinese models. The finial is in the shape of a linghi cluster of mushrooms.